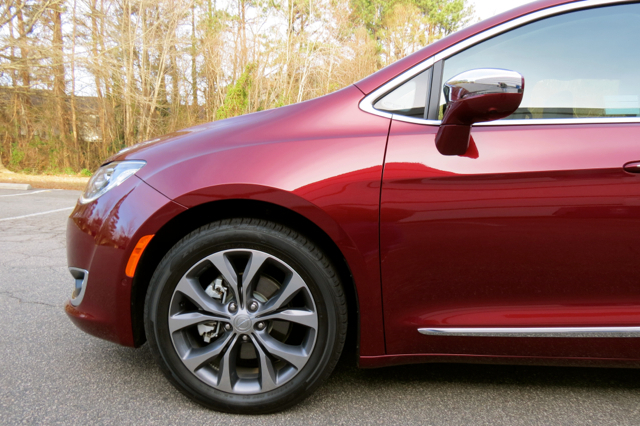 Chrysler’s award-winning minivan continues to attract new customers. It wasn’t supposed to be this way. When crossover utility vehicles began to take hold early on in this century, minivan sales were expected to decline, then eventually disappear as models were canceled one by one. Manufacturers such as Ford and GM were among the early casualties, while Chrysler, Toyota, Honda, Nissan, and Kia managed to stay put. After years of decline, something unexpected happened: sales rose by 6.3 percent in 2016, nearly erasing the losses of the previous year. 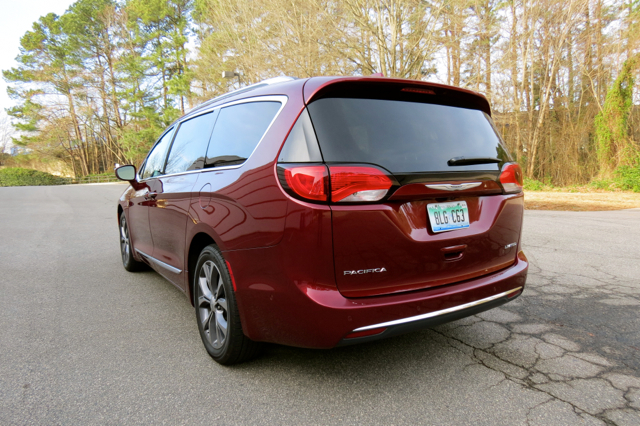 The Toyota Sienna barely edged out the Dodge Grand Caravan for segment leadership, with the Honda Odyssey coming in a strong third. 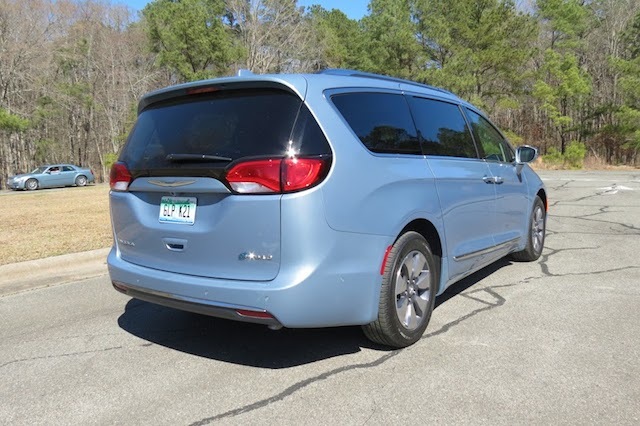 But it was an all-new Chrysler Pacifica model that shook up and injected new life into the segment, a seven-passenger model and successor to the Chrysler Town & Country. 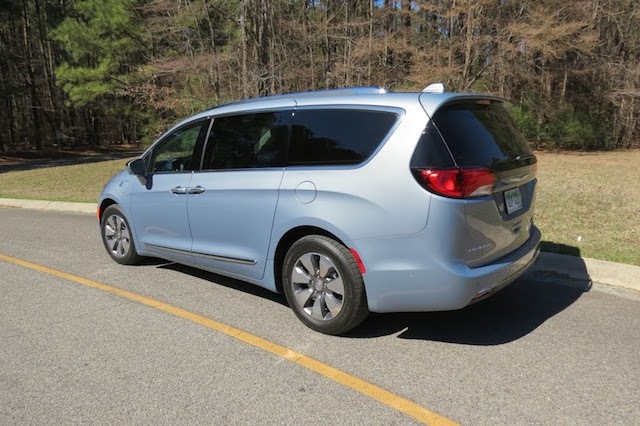 I tested the 2017 Pacifica last summer and was impressed by what Chrysler had done in fielding the new minivan. As sometimes happens, a manufacturer will deliver a model twice within the same year for a follow-up review. 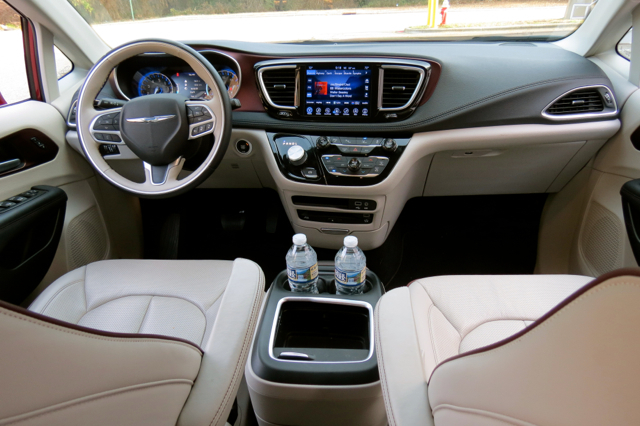 As before, I took delivery of a Chrysler Pacifica Limited, the top-of-the-line trim in this five-trim family. No, it wasn’t the same vehicle offered earlier— this one came in velvet red pearl coat; the earlier model was outfitted in bright white. 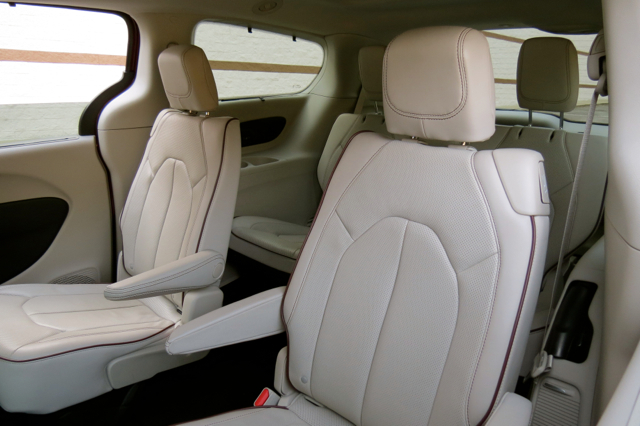 Other than that, all the features offered in this top Pacifica line were present. 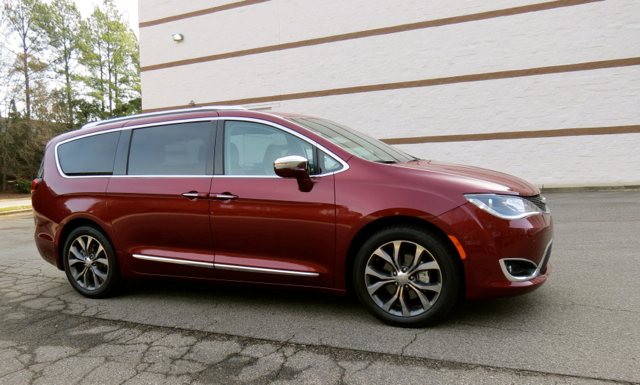 Chrysler offers the 2017 Pacifica in five trims, designed to fit most family’s budgets. You have a choice of the LX ($28,595), Touring ($30,495), Touring L ($34,495), Touring L Plus ($37,895) and Limited ($42,495). These prices include a $995 destination charge. Since the Pacifica was released, a plug-in hybrid model was introduced. 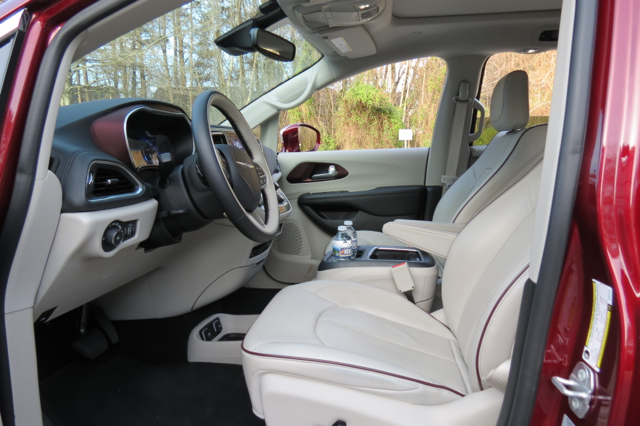 The Pacifica PHEV is available in two trims: Hybrid Premium ($41,995) and Hybrid Platinum ($44,495). I had hoped one of the PHEV trims was coming my way, but it wasn’t ready yet. I saw the hybrid Pacifica at auto shows in Washington, DC, and Chicago just days earlier, learning that the product roll out had just begun. My test model offered three packages, raising the final price to a lofty $48,475. A tire and wheel group ($995) brought in 20-inch aluminum wheels and locking lug nuts. A $1,995 Advanced SafetyTec Group added such features as front and rear park assist, adaptive cruise control with automatic braking, and automatic high-beam control. Another $1,995 upgrade (UConnect Theater Package) brought in a pair of video screens to the front seatbacks, a BluRay system, a 115-volt outlet, and a 220-amp alternator. A trailer tow package ($995) is also available and for no additional charge you can opt for eight-occupant seating. At the higher end of the price spectrum, Chrysler routinely adds discounting for bundling packages. As of this writing, a $2,000 credit is built in, effectively keeping your final price below $50,000, with taxes, tags, and registration extra. Both the standard and hybrid model are powered by a V6 engine. 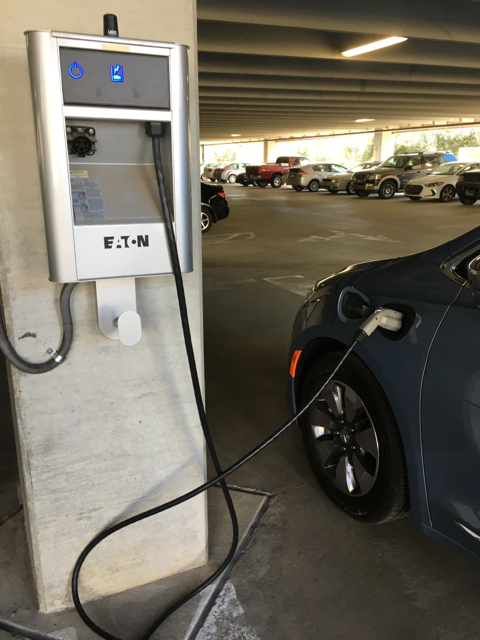 The gasoline version is paired with a 9-speed automatic transmission; the hybrid gets an electrically variable transmission along with dual-motor EV drive capability. The V6 makes 287 horsepower and 262 pound-feet of torque in the gas model. 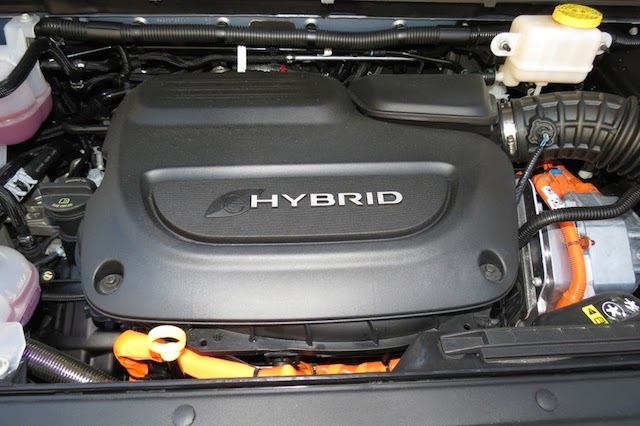 In the hybrid, you’ll have 248 horsepower and 230 pound-feet of torque at your disposal. The hybrid also provides 30 miles of electric-only range, effectively preserving fuel and reducing vehicle emissions. But this review is all about the model as tested — I’ll supply a separate review of the Pacifica PHEV if and one is offered to me. 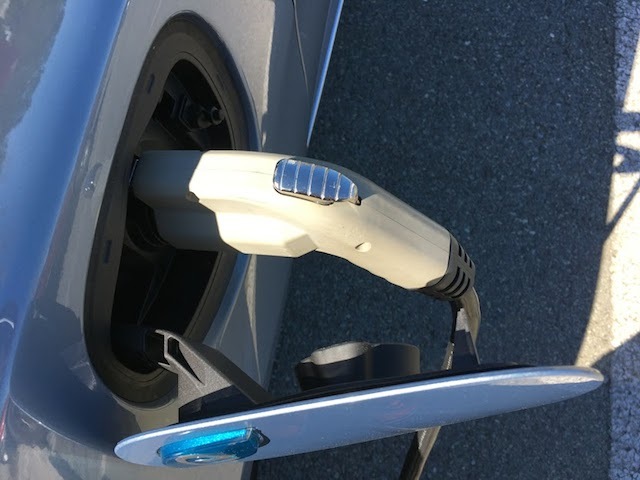 As for the fuel efficiency of the gasoline model, you can expect something in the neighborhood of the EPA-estimated 18 mpg in the city and 28 mpg on the highway. With the 2017 Pacifica, Chrysler opted for a new style direction, one first evident with the last-generation Chrysler 200 midsize sedan. This expression offers a sleek, modern fascia highlighted by flowing, available LED accent lights. While the look has helped the Pacifica, the 200 languished on the market and was discontinued following the 2016 model year. Now, Chrysler has just the Pacifica and the dissimilar looking full-size 300 sedan to show for it. Other style directives include pronounced character lines on the hood and profile, body sculpting, and available chrome-like touches. Further, the long roof line flows to the rear deck capped by a liftgate spoiler, oversized combination lamps, and a wraparound look rear window. All models come with dual sliding side doors and an assortment of 17-, 18-, and 20-inch wheel choices. Inside, you’ll find a standard 2-2-3 seating arrangement. A 2-3-3 arrangement is available for no extra charge. The second- and third-row seats fold and stow, offering 140.5 cubic feet of storage space (standard space measures 32.3 cubic feet). As expected, the interior is roomy, marked by long flowing lines across the dashboard and doors, with ample legroom everywhere. I particularly liked the arrangement for the center console — at the base of the stack is a large storage compartment. 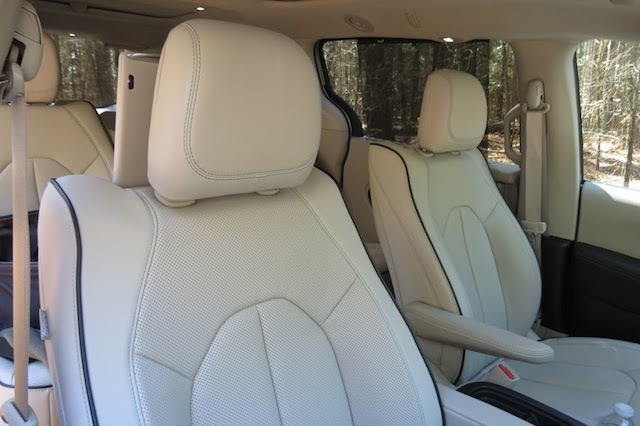 Instead of connecting the stack with the center storage space, a large open storage area is present and has a separate enclosed storage area between the seats. 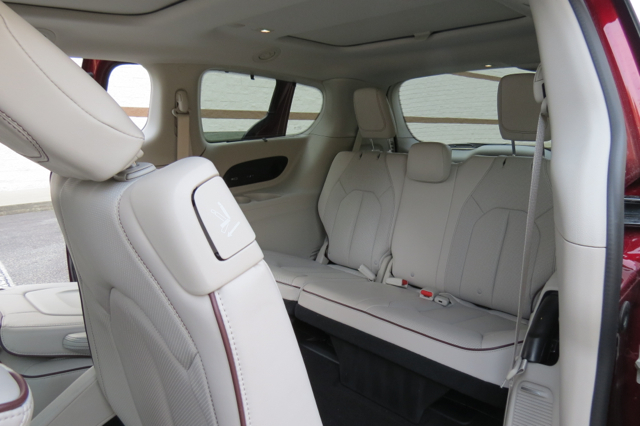 Access to the second and third rows is a snap, thanks to the dual sliding doors and seats that move and tilt forward. Cup and drink holders can be found nearly everywhere, with storage compartments and other hidden storage areas present. 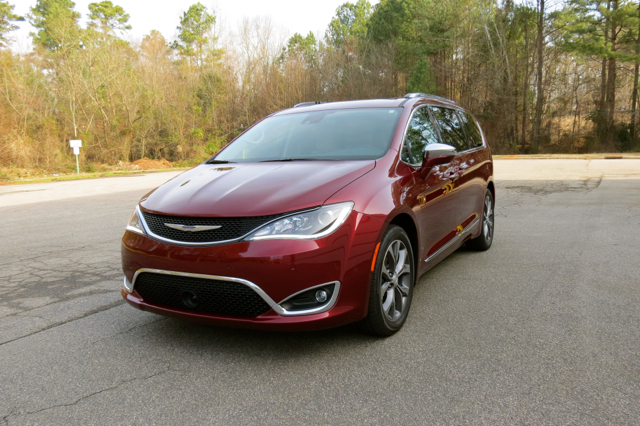 Chrysler not only launched the modern minivan segment, but the automaker has constantly strived to improve upon it. When it comes to crash testing, the 2017 Chrysler Pacifica received the highest marks from the Insurance Institute for Highway Safety (IIHS) and the National Highway Traffic Safety Administration (NHTSA). 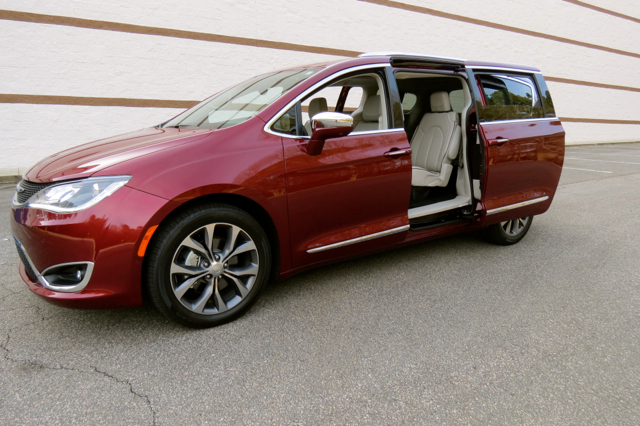 The IIHS awarded the Pacifica with a Top Safety Pick+ rating, while the NHTSA assigned a 5-star rating to the van. 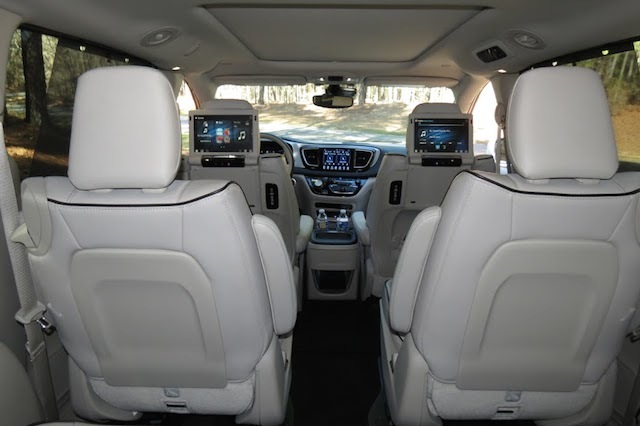 Beyond the expected suite of seat belts, traction and stability control, crumple zones, and electronic brake force distribution, the Pacifica offers more than 100 standard and available safety features. Lane departure warning, lane keep assist, front and rear park assist, a rearview camera or an available surround view camera, and adaptive cruise control is available. 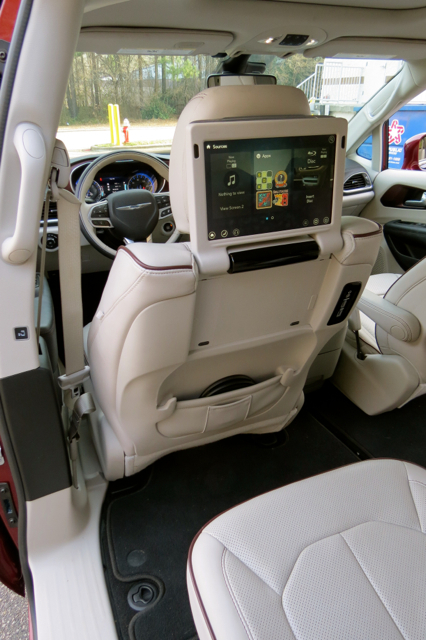 A standard UConnect infotainment system with a 5-inch screen, voice-command audio, and six speakers can be upgraded to an 8.4-inch screen with navigation. 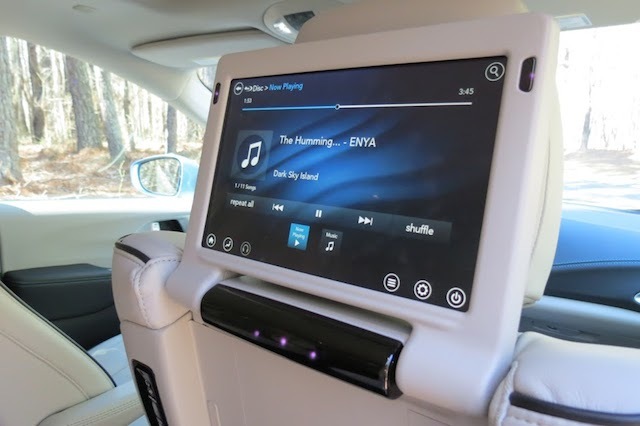 You’ll also get an assortment of apps, USB and auxiliary audio ports, satellite radio, and HD radio. Buyers also have a choice of a 13-speaker Alpine audio system or a 20-speaker Harman Kardon audio system. Minivans and V6 engines go together. Early on, such vehicles were powered by four-cylinder engines, but as these models have grown, larger engines are in order. I always feel that I am at a disadvantage when testing minivans under the typical driving scenario. My family of four takes up about half the seats, but typically one of my two sons will sit in the back row to give me his opinion of the seating area and the ride. The V6 has a lot of work to do when the payload is heavy. Chrysler doesn’t publish payload information, but I’m confident this vehicle can hold 1,500 pounds of people and their stuff without a problem. If you need to tow, you have a 3,600-pound limit to work with. 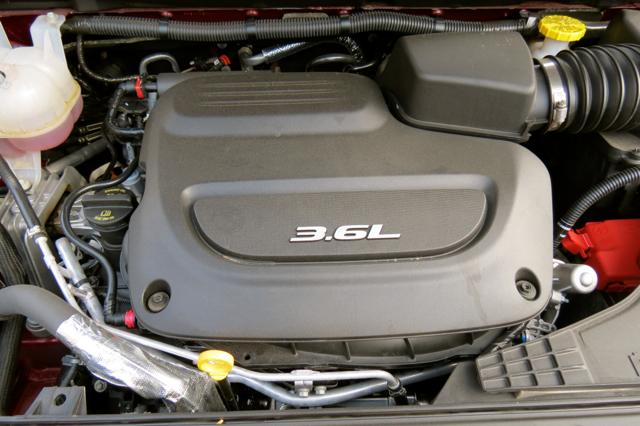 I like Chrysler’s workhorse 3.6-liter V-6 engine as it supplies generous amounts of power. From off-the-mark acceleration to ample passing power, this engine gets the job done. The current 9-speed automatic transmission is improved too —early on in other models, mapping issues meant the transmission was often hunting for gears — not quite “knowing” where to stay. Happily, that issue has disappeared. Steering is light to the touch — handling is ideal on a straight line. 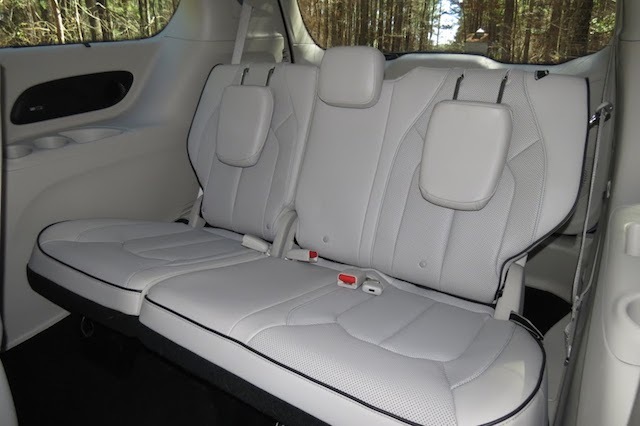 No minivan is designed to navigate twisty roads anywhere like a sports car, but you’ll find that ride comfort has improved over the previous Town & Country. In fact, this model is so much better than what Chrysler offered previously, that it is safe to say most buyers should find its performance more than merely adequate. For its second go, nothing stood out for me that I might have missed from my first drive last summer. 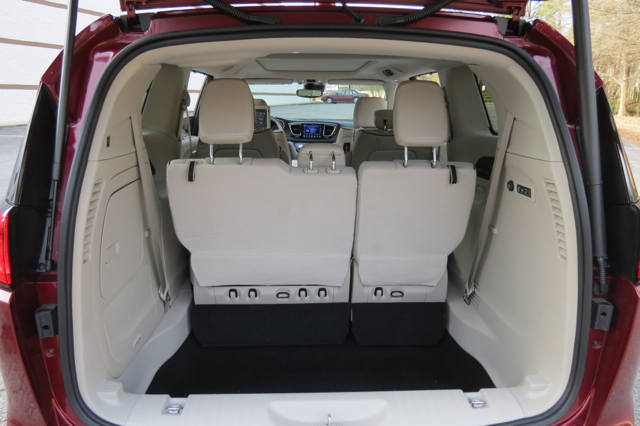 The Chrysler Pacifica is a fully capable people mover, offering a distinct utility advantage over similar-sized crossovers. I also think the 2017 Pacifica now sets the bar, something a Chrysler minivan hasn’t done since both the Toyota Sienna and Honda Odyssey came along. Perhaps its only weakness is brake feel as it doesn’t feel as firm as its chief competitors. 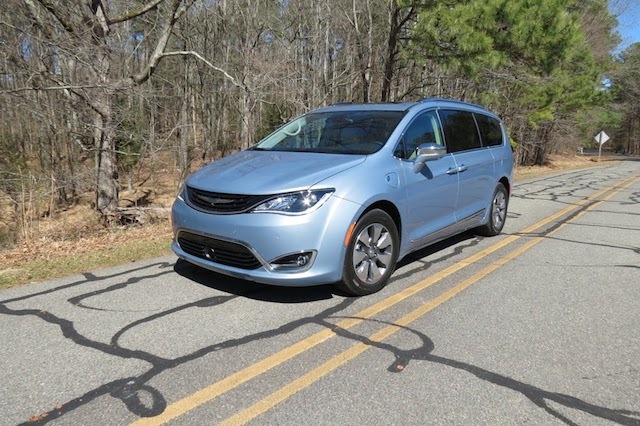 With a hybrid variant now in the mix, the Chrysler Pacifica offers something no other competitor has, further underscoring the manufacturer’s commitment to a segment that is very much alive. Besides the Sienna and Odyssey, other models to consider include the Kia Sedona and the Nissan Quest.